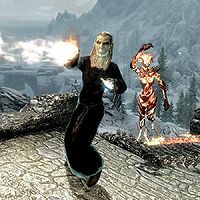 Conjurers are Conjuration specialists who prefer to summon Daedra in combat. They are typically found in a few caves, keeps, and ruins across Skyrim known as warlock lairs. These mages belong to the Conjurer NPC class. The type of conjurer you encounter depends on your level. You will continue to meet low-level conjurers even at high levels, but boss-level conjurers will always be at the highest possible level. Conjurers use Destruction magic and summon allies to fight for them in combat, and they carry a leveled dagger in case of close-quarters fighting (iron, steel, orcish, dwarven, elven, glass, or an enchanted dagger of any quality from iron to Daedric). They also have a 10% chance to carry a leveled Conjuration or Destruction staff. They wear a pair of boots along with black mage robes, hooded black mage robes, robes of Alteration, robes of Destruction, robes of Restoration, or robes of Fortify Magicka Rate. In addition to the gear listed above, conjurers have a small chance to carry potions, poisons, soul gems, Novice or Apprentice level spell tomes, ingredients (common, uncommon, or rare), recipes, and a small amount of gold. They also have atronach forge recipes in their inventories, but their chance of appearing in-game is set at 0%. 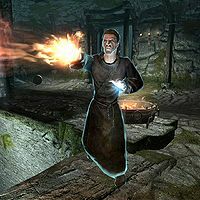 Master Conjurers and Arch Conjurers have the same gear as lower-level conjurers, but have a 50% chance to carry a Staff of Chain Lightning, Staff of Fireballs, or a Staff of Ice Storms and do not have the leveled lists for atronach forge recipes. ^1This Master Conjurer appears in leveled lists with conjurers, but is actually a Pyromancer, and has the appropriate class, spells, and perks for a generic fire mage of the same level. Apprentice Conjurer bosses have the same inventory as the lower-level conjurers listed above. Conjurer Adept, Conjurer, Ascendent Conjurer and Master Conjurer bosses have the same inventory as the Master Conjurers and Arch Conjurers listed above, with the exception that Conjurer Adepts and Conjurers have a 50% chance to carry a Staff of Firebolts, Staff of Ice Spikes, or Staff of Lightning Bolts rather than a Staff of Chain Lightning, Fireballs, or Ice Storms. Phinis Gestor Hall of Countenance A mage of the College of Winterhold and an expert trainer in Conjuration. Ansilvund: Kill Lu'ah Al-Skaven in Ansilvund. Most conjurers will summon their atronachs before attacking you with Destruction magic, but conjurers with the Conjure Storm Atronach spell will not summon Storm Atronachs. This is likely due to an issue with their combat style script.